Paul Harvey Johnson was born to Woodrow and Beulah Johnson on May 18, 1977. Paul was a loving person, he touched many hearts with humor and made many laugh. He was very energetic and treasured his family. 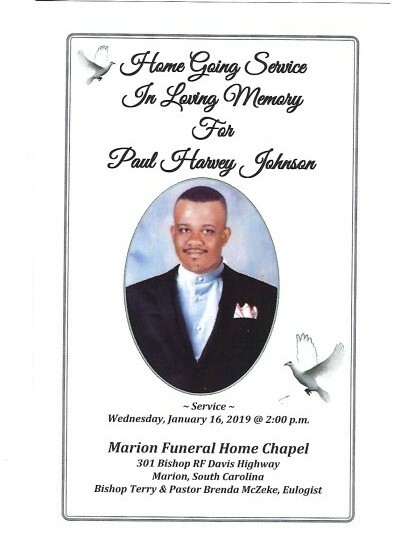 Paul attended the public schools in Marion County, South Carolina and gave his life to Christ at an early age and was baptized by his Pastor, Bishop Terry McZeke. Paul certain departure impacted many lives. He leaves to cherish his memories and love ~ his father: Minister Woodrow Johnson and mother: Beulah Johnson; his brother: Michael “Mike;” he adopted Linette a sister; adopted Steve as his brother; his favorite cousin: Christopher Taylor which he called his “hero” and a host of aunts, uncles, cousins, other relatives and supportive friends.